Do you ever feel like the work just won’t stop? You know… there’s paperwork, calls to make, people to meet, and oh – you also have a life! (Hopefully) Every day, you have buzzes and beeps and no limits to the amount of things that are trying to get your attention. And with all of the communication tools, does it feel like conversations are coming at you from every direction? And do you want to make next year your best one ever? Of course you do. I want you to take a deep breath and hang out with me for a few minutes today to shift your thinking to what really matters. 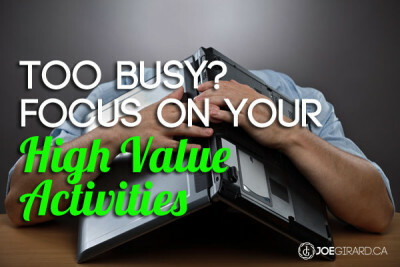 Let’s talk about high value activities and how to make your life easier while getting more done. So what are you busy doing? I’m the first to admit that I often spend time doing a bunch of things I shouldn’t. Well, maybe that’s a bit dramatic. What I mean is that there are many hours of the week I can end up spending on activities that don’t advance my business, relationships, or health. Do you feel like that sometimes? Like you’re treading water? I have been talking with a number of clients recently and it seems like it’s quite common for us to feel almost claustrophobic when it comes to our daily lives. And in some cases, being “busy” is used as a badge of honor and a metric for success. In business, it’s totally normal to have countless reports, checklists, and other “support tools” that you have to stay on top of every day, week, and month. And I know that it’s normal for salespeople to have volume quotas on number of calls and other activities. It’s easy to get distracted, but can you get focused? Follow the 80/20 Rule: 80% of your results will come from 20% of your activities. Let’s find those activities. Are you ever “too busy to plan?” Ask anyone who has succeeded and now has the free time you admire… if they skipped planning. What are some of the great ideas or thoughts you have that you just haven’t been able to sink your teeth into? What have you been putting off that you absolutely KNOW would move you forward? If there is a new project you want to tackle and can’t find the time, well you need to make a plan. Daily: Your day should be ready to go before you start it. Have you prepared yourself for what you need to do each day and set yourself up for success? Take 5-10 minutes at the end of each day and make sure you have everything you need in place for tomorrow. Get it out of your head and off your desk and ready to go for the next day. If you want to hit lofty targets in your life or business, it will be based on the consistency of your daily activities. And…if you don’t know what you are supposed to do each day, how do you know you did it? Weekly: Take a few moments either on the weekend or first thing Monday to set your focus on the week ahead. What should you pay attention to? Any relationships you want to foster this week? Any items you can prioritize to get tackled and finished? Get rid of the to-do list and schedule these bigger projects into your schedule as bite-sized chunks. Quarterly: if you have checked out my 90 Day Sprint, you will know how to do this effectively. But you don’t have to go crazy. 90 days works like magic because it is long enough to make something happen, but short enough to see the finish line. Each quarter, do a review of your world and identify that one big idea you would like to take action on. Make it the theme for the next 90 days. Everything else, move it to the next quarter. Take the time to plan and you will quickly see there is more time every day, week, and quarter for you to make things happen. If you don’t know what you are supposed to do each day, how do you know you did it? First off, I’m not saying don’t make your existing relationships a priority – but for the sake of growing your business, how you begin new relationships is essential. And high value. For you salespeople out there, you were probably wondering why I mentioned sales call volume, right? Everyone has heard the saying that sales is a “numbers game.” Well in my experience, sales is more of a quality game, that when done properly, will allow you to do more with the numbers you have. The key to high value activities in selling is getting it right the first time. How quickly are you authentic? Do you rush to solve before asking the right questions? Do you simply pitch information or are you a source of insights? Do your customers see value in speaking with you, or are you simply a commodity? After all your great conversations, are you weak when you ask for commitment? Can you connect, get into flow, and stay there? All of these things happen during that first point of contact. In every business. As first impressions. And they set the tone for everything that happens afterwards. If you find yourself chasing countless customers, sending mass emails, and leaving tons of voicemails, that may FEEL like work, but in reality it’s not. When you focus on the prioritization of your new relationships, everything becomes easier. In every business. And in every role. For a simple tool to help you nail that initial conversation, check out my sales call rubric for $19 and it comes with a training video as well. It’s the tool that I use with all my clients as well as myself to make sure I am ready for every first conversation. Days have a tendency of just flying by. It’s like when you drive somewhere and don’t quite remember how you got there. Sound familiar? When you don’t stop to observe what happened, you miss important things like missed opportunities or stuff that can fall through the cracks. Make sure that when you are doing your planning, you combine it with reflection and ask yourself questions at the same time. You will quickly see trends and ways to improve and not find out the hard way when you missed something and it’s too late. But there is a catch. I see often, people use their journaling time, reflection time, or reporting time to simply record what happened. Don’t just record what happens. Don’t just download results and forget about them. You need to use that time to understand. What did I learn? What trends do I see? Is there anything that I should do more of? Less of? What will take action on? If you don’t ask yourself how you will improve, who will? When I started working from home I found it difficult and often overwhelming until I realized why. My desk was a mess. And years ago, I traveled to visit one of my staff at her office in the morning and she was feeling stressed. I could see she was overwhelmed, so I asked her what was up. And we did. We rescheduled some appointments and made the time. We went through every single thing in her office that day and sorted it. Do now. We did it. Delegate. We found the people who could help and had them help. In a few hours we had sorted what had been driving her crazy for months. For my home office, every week I make sure I get every single piece of paper off my desk and filed. It does wonders for your productivity. What do you use to remind you of your tasks? Do you use a calendar, a to-do list, or other technology? Or are you like a lot of others who use sticky notes? Well I use sticky notes too. You have something important to remember so you write it on a sticky note. That note goes at the bottom of your laptop or by your computer. Later in that day, you see the note and remind yourself it’s important, so you move it and stick it to the bottom of your computer screen. Then eventually you have to move it smack dab in the center of the screen. And for some weird reason, you still ignore it. Am I right? What about your alarm in the morning? Have you created this amazing unconscious way to hit snooze without even waking up? Just like anything, if you have a tool that you begin to ignore, it’s time to change it up. Keep it fresh. When everything is trying to get our attention, it’s easy to begin to ignore and often it feels like these tools control you. And that is how the low value activities will creep in. You will just simply get busy for busy’s sake. One of the most often overlooked high value activities is working on growing yourself. How often do you consciously develop your skills, behaviors, attitudes, and mindset to give you an edge? Are there areas of your life that are nagging at you and you haven’t addressed them? Would you like to be more skillful in certain areas of your business? When was the last time you read something that helped you advance your skills (other than this post)? How much time do you spend on growth activities versus maintenance ones? If you spend most of your time just making things function as they are and less time on making them better, then it will take a long time to see change. Don’t fall down the rabbit hole of too much information. It is easy to get caught up clicking on the next link and website and five step process until now you have twenty pages of notes and are overwhelmed. Stick to one area and learn it. Take action on one thing at a time. Don’t try to do too much. But you must take action. You can’t just expect the information to stick when you are passively reading, listening, or watching. Apply the lesson, test it, evaluate it, and learn from it. That’s how it will be meaningful to you. Make a plan to learn, don’t expect it to just happen. It’s easy to start on developing and then get too busy or even do too much. Again, control your calendar and allow for the right learning at the right time and you will see constant progress. When you have a learning mindset and make developing yourself a priority, it will be one of the highest value activities you do. How much time do you spend on growth activities versus maintenance ones? Take ownership of everything you do each day. Set those plans, schedule them, and get them done. Continuously adjust so that you are always working on your highest value activities. Take the time to identify the things that matter and work on getting rid of the stuff that doesn’t. Remember to like and share this. And comment below on what activities make the most impact for your days.